I was walking down along the Rhone riverside with my friend Marc, who is also français par mariage, and conversation turned to cameras. He expressed that he just can't get the hang of capturing his rapidly moving toddler with his Canon Rebel, especially during family time in the evenings when the light is dim. Talk with Fran has been Canon-centric in these past few weeks, and she recently showed me a neat shortcut I never knew existed on my own camera. 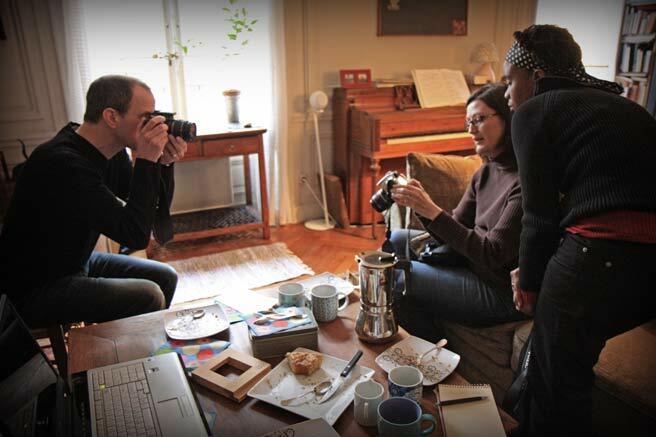 It just so happens that my new friend Jo also has a Canon and has been talking about composition and her recent efforts to capture moments of her life here in Lyon. This got me thinking. I have friends I meet with one on one but they have never met each other. I want the map of our individual friendships to expand into more of a web. All the more supportive and resilient for us all. So this morning I made a cake and they all came by for coffee and camera talk. We gave assignments and set a general challenge for our first group theme. The satisfying thing about the whole thing was being able to say "ok now turn the dial this way" with immediate tangible results instead of having to go to all of the effort to wrap the mind around descriptive written explanations. Such a pleasure. In any case, there certainly was a warm sense of community in our meeting today. I can't decide if it was the group, our sitting around the coffee table face to face, or the satisfaction that comes from teaching and learning that hit the spot like it did. The cake turned out pretty well, too. - Turn on the oven to 375F / 190C, and let it heat while you put the batter together. - Grease a 9 inch hollow centered springform pan. - Measure the 1 cup of the flour, salt, and baking powder and set aside. - Cream 5 tablespoons of the butter and 1/3 cup of the granulated sugar until smooth. - Add the egg and beat until smooth. - Add half the flour mixture, half the milk, the remaining flour, and the remaining milk. - Pour the batter into the pan. - Melt the remaining 3 tablespoons butter in the microwave while you peel and slice the apple. - Mix the apple, butter, brown sugar, and remaining granulated sugar in a small bowl. - Remove the apples from the butter sugar mixture, leaving most of the sugar and butter in the bowl, and place the slices on top of the cake batter. - Add the remaining 1/4 cup flour to the remaining butter and sugar mixture, and work it with your fingertips. - Sprinkle the flour, sugar, and butter mixture over the apples and cake batter and transfer the pan to the oven. - Bake for 25 minutes and let cool at least 10 minutes before serving. Well that just sounds like fun. Camera talk and cake......It's a funny feeling isn't it to realize some people in your life haven't met other people in your life. I like the photo you chose for your photo group post, really captures a moment. What a fun idea! I hope you share what you learn! Thanks for setting it up Lucy; I spent the rest of the day continuing to "turn the dial that way"! It was wonderful to meet new people and learn new things. Thanks for being the catalyst. Makes me wish I lived in Lyon, actually. I shoot with a Canon, and I'd love to mingle with other people who do. Especially if I can also practice my French and eat coffee cake! Oh that does sound nice. I'm getting the same mark, Canon but maybe not the same model. It's my first DSLR and i have a lot to learn. I wish we lived closer! Sounds like so much fun -- friends, common interests, food. I love anything with apples.